"First Thursday", "First Friday", "Last Thursday" -there are so many opportunities to see some great art in this town! I keep telling myself I'm going to get out more, SEE more . . . DO More! But it's so hard to push myself out the door. I'm lazy, antisocial and frankly a little intimidated. But when I do bite the bullet and head out into the world, I am usually rewarded with a great sense of fulfillment. It's a charge that fires me up and feeds my hungry soul! On Friday night, Julie and I ventured out to see the art opening of a friend-of-a-friend. It was fun to discover The Bite Studio. Great work there! We really enjoyed etchings of Shawn Demarest and were intrigued by the block prints of Cameron Thomson. We recommend that you check it out. While we were there, we were told about an art 'Happening' near by. 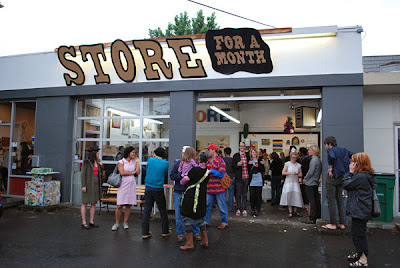 So we hightailed it over to The Store for a Month, (on the corner of SE 12th & Division). How FUN! 60 artists working together to create 'products' to sell in the store for a month. I love it! I love the transient nature of it, (the sign is made out of cardboard!). It felt to me like a bunch of legitimate and pretty respectable local artists letting their hair down and goofing off. I appreciate the reminder that art does NOT have to be stuffy or even serious. It feels good when its playful! So for a good time, go to The Store for a Month -you might even get lucky and score a piece of pie!